When authors or publishers get to a certain age, roughly 37, they are issued with a shapeless blue linen jacket. They then fill the pockets with books, papers, tobacco and various literary ephemera to make it more shapeless still. Men in the literary world are not known for their sartorial elegance, so I was very impressed when I started attending wine tastings how well dressed everyone was. The first I went to as a wine blogger was a Brunello tasting and there was the Marchesi di Frescobaldi, immaculate in tweed and silk. And it wasn’t just him; his PR man John Franklin was wearing a nicely cut grey flannel suit. I felt scruffy, whereas in publishing I was thought to be quite the dandy. The wine trade is one of the last hold outs of Le Style Anglais, that idealised version of English fashion developed in and around St James. It consists of shirts from Jermyn Street, shoes from Churches, suits from Savile Row and a tweed jacket with red or mustard yellow trousers from Cordings. Noted devotees of this look include Jacques Thienpont from Château Le Pin and Javier Hidalgo from the sherry family, who was immaculate in a three-piece Prince of Wales check suit at the Great Fortified Tasting last year. One of the most charming things about Le Style Anglais is how the Europeans get it slightly wrong – everything is too new and too sharply cut with not enough smell of a dog blanket in the boot of a Volvo 240 estate. This uniform is a throwback to when the British dominated the global wine trade, so it was fashionable to ape their look. In 18th century Porto some of the locals even affected speaking Portuguese with a British accent. Until very recently, it seemed that the British hold on the sartorial standards of the trade was absolute. If you were in London selling your wine then suits or tweed ruled. A couple of summers ago, however, I glimpsed the future. I was walking down Brick Lane dodging the restaurant touts, looking for the RAW wine fair when I spotted a crowd of men who didn’t fit in. Their faces were weathered, they smoked intensely, they were scruffy and a little drunk. At first I thought they might be hipsters, or indeed vagrants, but they were speaking French – vignerons! The look is the same: beards, check shirts, and a certain unwashed smell. Previously when the French came over to sell their wine they would dress up; now they were dressing down. I couldn’t work out whether hipsters dress the same as winemakers or the winemakers were in fact hipsters. Or perhaps they were dressing up as hipsters in order to sell their wines and then went back to the usual beret, Bretagne sweater and onions when they went across the channel. I see the Natural Wine Movement as a reaction against the Anglo wine establishment. Is it any wonder that you rarely see natural wines from the Douro or Bordeaux? Its spiritual heartlands are the places with the least British influences: Burgundy, Beaujolais and the Loire. They are supported by a network of American writers and bloggers – it’s like the American Revolution all over again. This is reflected in the wines, but also in how the producers dress. It is the French sticking two fingers up to the English. But it’s not just the French being difficult. There are those who see Le Style Anglais as evidence that wine trade is too male, too stuffy, too out of touch. 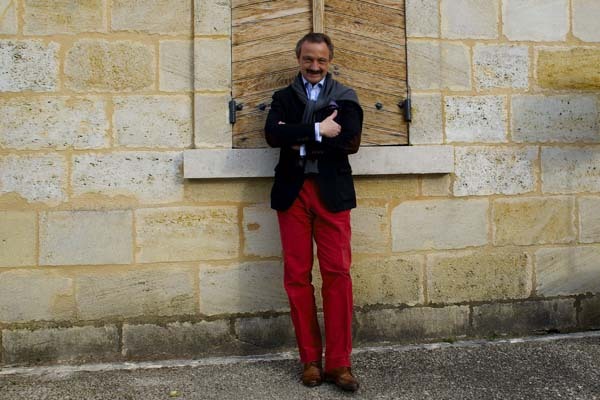 The red trouser is the symbol of that most reviled of species, the wine snob. The Daily Telegraph wine writer Victoria Moore explicitly outlined this in a recent column on the new wave wine merchants: She wrote that the wine trade has traditionally been “a bastion of red trousers and thick third sons.” For natural wine fans and trendy wine merchants, scruffy attire is a sign of egalitarianism. Now nobody likes equality more than me, but I don’t want to see the wine trade lose one of its most distinctive features. Can’t we be unsnobbish and still dress well? And don’t forget, wine bores come in many guises. They don’t always wear red trousers; in fact, the most condescending person I’ve met was in a trendy wine shop in the States. I’d hate to go to the Great Sherry Tasting in 2017 and find everyone dressed as if they work in a second hand record shop or, worse still, as if they’re attending a literary festival. Brothers! Keep the red trousers flying! The Real Wine Fair is on in London on 13th and 14th April. I will be attending in mustard yellow cords and a tweed jacket from Daks. See here for more details.